A Phoenix police officer was shot Aug. 16, 2018, but managed to wound the suspect who fired at him during a traffic stop, authorities said. 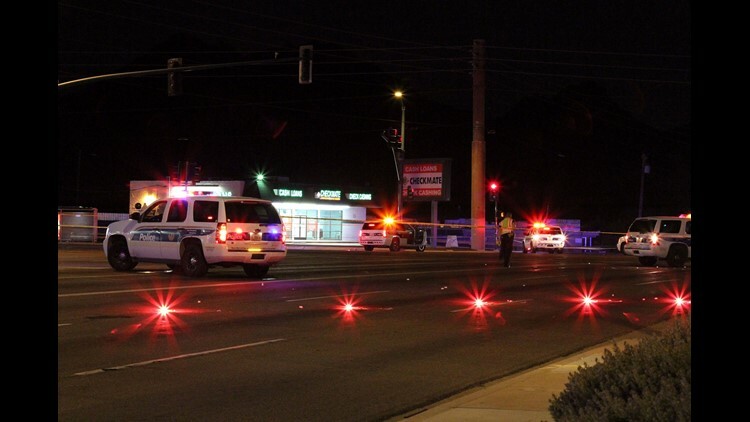 PHOENIX — A police officer remains in critical condition Friday after being shot during a traffic stop, Phoenix Police Department officials said. But the officer, who was getting out of his marked squad car, was able to return fire and wounded the suspect, who also is in critical condition, Sgt. Mercedes Fortune said. Neither the names of the 27-year-old officer, who has been with the department two years, nor the 41-year-old suspect were released. "In my opinion, I believe he was ambushed,'' Police Chief Jeri Williams said of the officer, who as of Friday morning was expected to survive. "We're all breathing a sigh of relief that our officer is going to be OK."
The suspect also is expected to survive. The shooting took place about 8 p.m. MST Thursday at Cave Creek and Cactus roads, about a dozen miles north of downtown, Fortune said. Though the officer is listed in critical condition, he is stable, said Phoenix Law Enforcement Association officials, who have been waiting with family members for updates on their colleague's condition. Williams said the shooting was another example of an increased level of violence that Phoenix officers have encountered, especially involving people with firearms. The number of assaults on Phoenix police officers increased 45 percent in the first five months of this year compared to the same period in 2017, data the department provided to The Arizona Republic shows. Of the 419 documented assault cases, suspects punched, charged toward, shot at or spit on officers. In January through May last year, police were assaulted 288 times, data shows. Assaults in which the suspect was armed also spiked. One of every 24 assaults on Phoenix police in the first five months of 2017 involved a suspect armed with a gun, department data shows. That surged to 1 in 10 in the same period this year. "This is a serious issue. We're taking it seriously,'' Williams said, noting a $149,000 study has been initiated to examine the spike in Phoenix police-related shootings this year. The shooting was the 66th involving a law-enforcement officer in Maricopa County this year, and the 34th involving Phoenix police, according to a count maintained by The Arizona Republic. In 2017, the Phoenix Police Department had 21 shootings, 25 in 2016 and 17 in 2015, department data shows. Thursday's shooting shows how officers never know when they might encounter a violent person, Williams said.